After spending months cataloguing your most desired gifts in dozens of wedding registries, it is finally time to enjoy your new crystal stemless wine glasses and commercial grade kitchen stand mixer. You were even gifted that personalized set of monogrammed china you've had your eyes on. 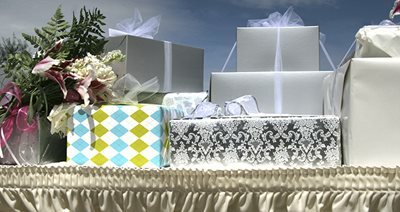 Summer is the time for wedding-goers to invest in big ticket gifts for newlyweds, and Meemic Insurance Company reminds everyone to take the time now to ensure those high-priced items are properly insured. It is smart to protect your costly new possessions from risk of theft, damage or loss. As newlyweds, it is easy to forget to catalog your gifts with the honeymoon and other post-wedding activities keeping you distracted. However, it is important to remember that along with thank you notes, you should also take inventory of your new lavish gifts. If you have a homeowners or renters policy, your personal property is insured. Be aware, however, that there may be limitations based on coverage amount and the type of risk that is covered. "After a wedding is the perfect time to take inventory of what you own," said Pamela Harlin, spokesperson for Meemic Insurance Company. "Having an updated inventory will not only allow you to properly access your insurance needs, but will also provide peace of mind if a catastrophic event resulted in a loss to your newly shared personal property." Take the time to work with your local insurance agent to determine the type of insurance coverage you have and if expanded or specialized coverage is needed for your high-priced gifts.